CADEAUX JEWELRY was founded in Germany 1975 by a sculptor and goldsmith to create a jewelry identity that conveys personality and continues to evolve in relation to developments in art, culture, techniques and materials with originality and authenticity. BAECHTOLD LIMITED is licensed by CADEAUX GINKGO AG of Switzerland – the owner of the trademark and all associated designs – to manufacture and distribute CADEAUX JEWELRY in Thailand since 2001. BAECHTOLD LIMITED operates two retail shops in Bangkok under the name CADEAUX JEWELRY and three CADEAUX JEWELRY points-of-sales in department stores. 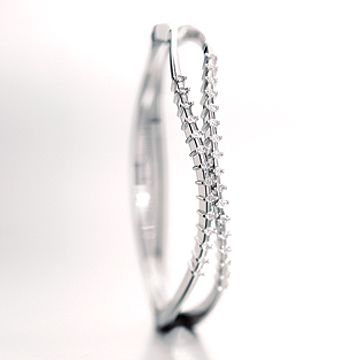 German sculptor and goldsmith Evert Hofacker established CADEAUX JEWELRY in 1975. With a purpose to create a jewelry identity individual to the wearer, he invented the Two-Prong-Setting, an innovation he patented in 1977. He won international design awards and his creations captured the spirit of an era characterised by free-form, an influence famous particularly in music. The style is admired by collectors and designers, notably in the designs Jazz II (left). From 1975 until 1999 CADEAUX JEWELRY markets its products in Germany, Austria, the Netherlands and Switzerland through independent retailers, and worldwide through events in Hong Kong, Japan, Taiwan and the United States. In the 1980s CADEAUX JEWELRY softens its design introducing the life-line concept and organic forms, including the Ginkgo leaf brooch in 18 Karat gold, representing a symbol of harmony, love and everlasting values. The Ginkgo leaf picks up on the symbolism of Ginkgo biloba, known as the leaf of the Maidenhair tree, an ancient species over 300 million years old, a living fossil native to Asia and with a history of endurance, hence a symbol of longevity. Some trees find their way to Europe in the 18th century, some particularly adorn Weimar, home of Johann Wolfgang von Goethe, Friedrich Schiller and Johann Sebastian Bach. The Ginkgo’s bilobed or split leaf moves Goethe to see it as an icon of duality, of two-in-one and one-in-two, a symbol of harmony and love. 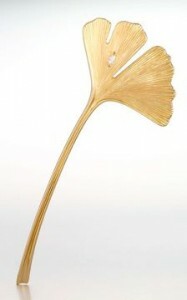 In 1815 he devotes a poem to the Ginkgo leaf, one of his most adored love poems. 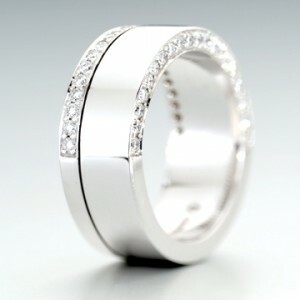 In 1990 CADEAUX JEWELRY introduces a design which is purist and modern with distinct lines. The designs by CADEAUX JEWELRY precede a style that by 2000 dominates the modern jewelry. The most significant creations belong to the Moderne series and include Hamburg and Berlin rings and bangles. In the new millennium CADEAUX JEWELRY explores the growing desire for self-expression. Hedonism, emotion and tactility materialise to communicate both to the wearer and to the outside. CADEAUX JEWELRY builds an iconography onto its modern base, fusing gemstones and symbolisms into a jewelry identity marked by expressiveness. BAECHTOLD LIMITED opens two CADEAUX JEWELRY shops and three shop-in-shops in department stores in Bangkok, and continues to strictly adhere to CADEAUX JEWELRY’s quality guidelines that guarantee an authentic product made of 18 Karat gold and provide a statement of personality.